Whoever wins the race for Ramsey County attorney in November will oversee a budget of about $38 million and several hundred employees. Current Ramsey County Attorney Susan Gaertner is stepping down after 16 years. 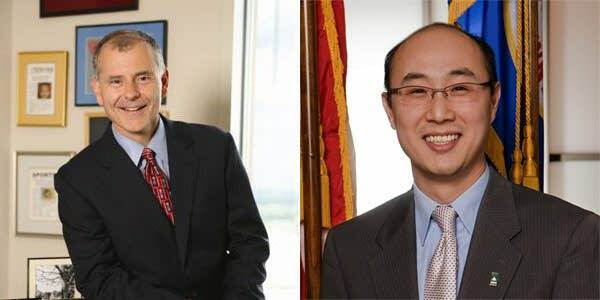 Outside a recent Hamline Law School debate, candidates John Choi and David Schultz strove to outline their differences. Schultz emphasized his courtroom experience. "Unlike John, I have personally handled criminal cases, I have made the decision to charge somebody with a felony for which they would face significant prison time," he said. Schultz's career includes a stint with the Minnesota attorney general's office, and work with a large Minneapolis law firm. For his part, Choi touts his four-years as St. Paul's city attorney, where he emphasized diversion programs for low-level offenders and other criminal justice programs. "I have achieved great outcomes and I have transformed a public law agency," he said. "I've improved public safety results in St. Paul." Choi says his management skills and experience as the city's chief prosecutor make him best qualified for the job. Schultz has taken shots at his opponent for accepting the Democratic party endorsement. He also criticizes Choi for his role in the Republican National Convention two years ago, when Choi's office handled 672 arrest cases brought by police. The vast majority of the cases didn't result in charges. Schultz said if another convention comes to town -- as Minneapolis hopes to do with the Democratic National Convention in 2012 -- he'd do things differently. "I would want us to evaluate the cases in the same manner that we would evaluate any other case: is there evidence to prosecute?" he said. "If so, we'll charge and move forward and we will charge. And if not, then we won't." Choi said his office could not find enough probable cause to bring most of the RNC cases to trial. The Ramsey County Attorney prosecutes juvenile criminal and adult felony cases, including domestic abuse as well as gang and gun cases. The chief prosecutor represents the county in civil cases and enforces matters such as child support, restitution and child protection. The office also helps set crime policy and makes recommendations on sentencing. In one recent high-profile case, Ramsey County attorney Susan Gaertner dropped charges against Koua Fong Lee. The St. Paul man was serving an eight-year sentence for a car crash that killed three people in 2006. Lee, 32, was convicted of criminal vehicular homicide despite insisting he did everything he could to stop the car before the crash. The accident, involving a 1996 Toyota Camry, got a new look following widely publicized problems with sudden acceleration in newer model Toyotas. After four days in court, a judge ruled Lee should get a new trial. And just after the judge announced her decision, Gaertner said she would not appeal or seek to retry Lee's case. Schultz said he doesn't have any reason to second guess Gaertner's handling of the Lee case. He said he'd consider bringing new charges against Lee only if new evidence emerged. Choi also said he doubted there would be new evidence to recharge Lee. Choi called the Lee case a "miscarriage of justice." "When you don't have the evidence to move forward in a case then the right thing to do and what prosecutors should always be doing is to dismiss the case -- that is your ethical charge," he said. "You are a minister of justice." Susan Gaertner -- the first woman to serve as Ramsey County attorney -- said she doesn't plan to endorse either of her two potential replacements.